The neighborhood in which we purchased our new home has (buff color aluminum) five foot fences separating the property lines, and enclosing the backyards of each of our houses. From a curb appeal standpoint our new fence is nice, providing more of a wide open spaces kind of feel than our previous neighborhood which had the standard eight foot high wood fence. What I didn't realize is a five foot fence doesn't give you as much privacy from your neighbor, and I've found that I miss my privacy while I'm sitting outside on our porch. Specifically on the north side of the patio. The backyard is deep enough from our neighbor to the back and the south side has the patio door that opens into the dining area, so the north side is the only side that gives me that "fishbowl" feel. 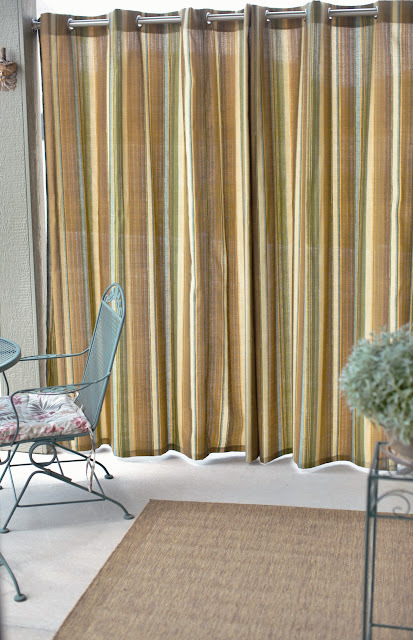 So, I decided to make some curtains that I can pull closed when I'm outside reading, or when we're chatting out back. My little private space is starting to take shape. 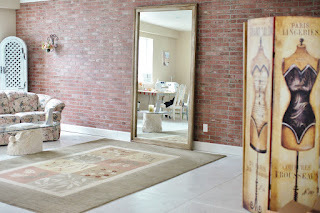 The curtains are up, I found a nice jute rug....I plan to get a couple of rattan chairs with cushions to put in this area and move the table and chairs out just a smidge. 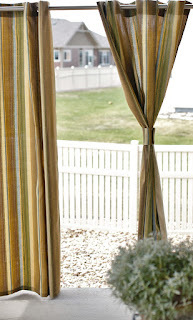 As for the curtains, I found a nice striped outdoor fabric that complimented the green paint of the house and the new rug pulls in the neutral stripes. 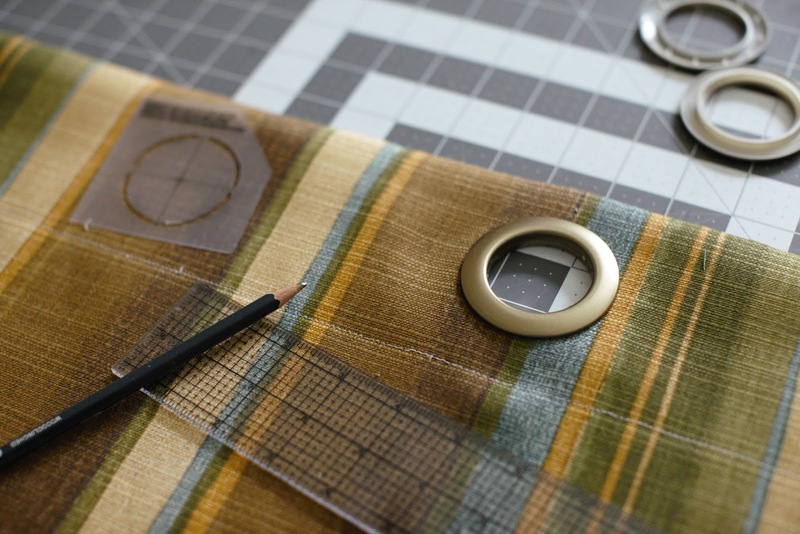 Making them was really simple, and I love that you can now purchase the large grommets for the header that you find on so many off-the-rack curtains these days. Each package contained eight grommets, so I needed two packets. The instructions were very well done and included a template to make life really easy. I chose to make two panels with tie backs. I thought it would look nice having two separate panels tied back when they're not in use versus one, but that was the only reason I went with two versus one large panel. I weighted the hem with curtain weights, since I knew it would be helpful with the breezes that we get. However, I already can see I need to think through another solution. I found the very day I put them up we had a decent breeze and the curtains danced their way across the top of the rod and actually opened up completely all on their own. So, I'm thinking through a way to secure them on either side to keep that from happening. I know I'm going to really enjoy this area now! And, it will break down easily when we have to winterize. Roll up the carpet, hang the curtains on a hanger and store the rod until the next season. I absolutely love the flavor of this salad! I looked through several online recipes and chose to use a mixture of what I read to make my very own version, and I'm proud to say it turned out delish! I made it earlier in the day and refrigerated it until dinner time, and I literally couldn't wait for the dinner hour to arrive.....fortunately, I made a large batch so I'm looking forward to another helping today! 1. Dice or pull apart the chicken breast. 2. Combine yogurt, mayo, mustard, honey, salt and pepper and mix well. 3. 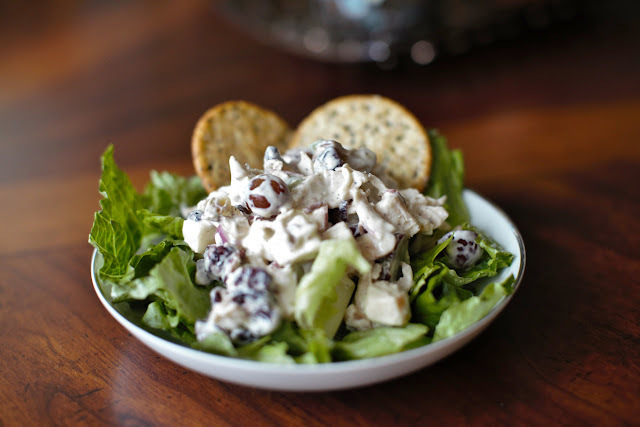 Add chicken, grapes, apples, cranberries, celery, almond and onion to a large bowl. Pour the dressing over and mix well. 4. Add a few almonds just before serving for garnish. Enjoy over romaine lettuce, in a tortilla wrap or as a sandwich! It's a special bonus when you find a tasty recipe that is also super easy. Just a few minutes of prep time, then all the ingredients go into the same pot and you're ready to eat a quick 15-20 minutes later! Now that I see how quickly a yummy one pot pasta meal can all come together, I'm going to have to experiment with some of my own varieties! * The original recipe called for 4 cloves of garlic (I scaled it back for my husband's taste). It also called for 5 cups of vegetable broth; it was a bit soupy, so I suggest just one of the large containers of broth. 1. Rinse the mushrooms. Slice thinly. Drain the artichoke hearts and roughly chop them into bite-size pieces. Thinly slice the onion and garlic. 2. 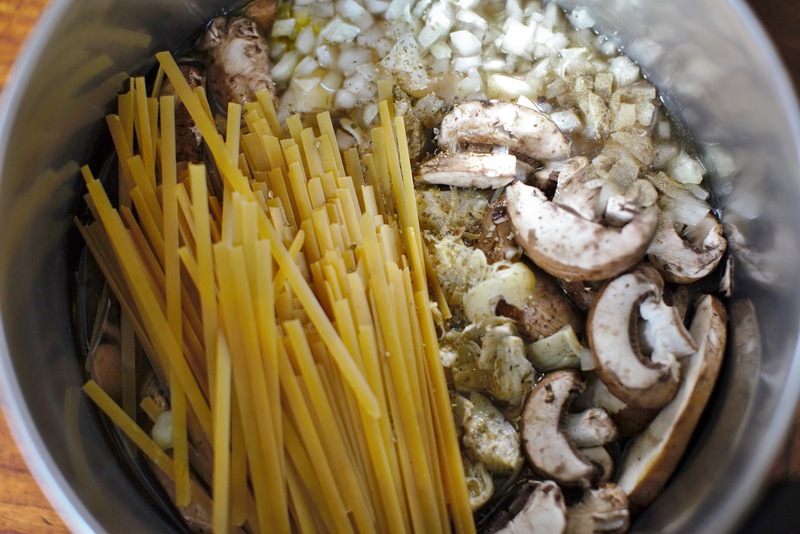 Place the vegetable broth, olive oil, mushrooms, artichokes, onions and garlic in a large pot. 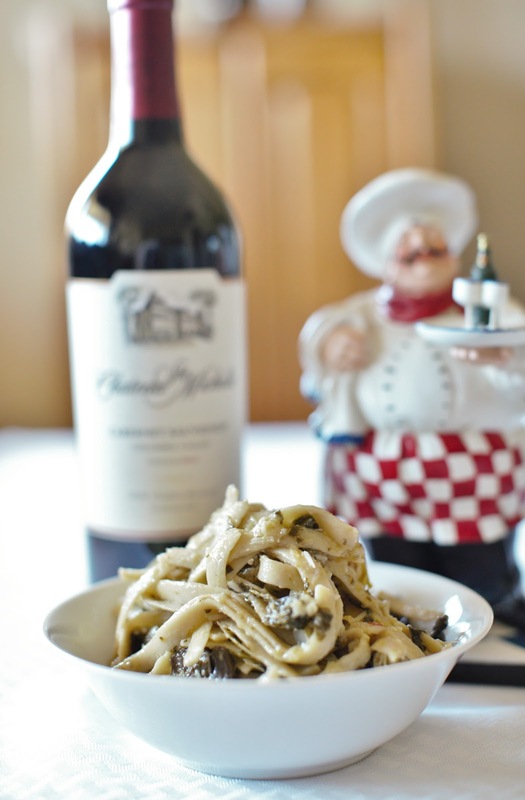 Break the fettuccine in half and add it to the pot along with the oregano, thyme, and some freshly cracked pepper. Push the ingredients down under the broth as much as possible. Place a lid on the pot and bring it up to a rolling boil over high heat. 3. As soon as it reaches a boil, stir the pot to evenly distribute the ingredients and prevent the pasta from sticking. Turn the heat down to low so the pot is just simmering. Allow to simmer with the lid on for 15-20 minutes, or until the pasta is tender and most of the liquid has been absorbed. Give the pot a stir every few minutes. 4. Once the pasta is cooked through, add the frozen spinach. Allow the heat from the pasta to thaw the spinach. Stir the pot to help break up the clumps of spinach as they melt. Serve hot. This truly is a dream come true! I have always wanted a full length mirror in my studio. I just never liked the prices that went along with them. But, serendipity stepped in, and made my dream a reality......here's how everything fell into place. In our new home, the master bathroom mirror had a scratch on my side of the mirror, just about eye level. It was only about an inch long, but totally annoying and something that could not be repaired. Thanks to the warranty process of buying a new home, the only thing they could do was replace it. This is a 6' mirror! During the time we were waiting for it to be replaced, I thought how awesome it would be to frame it and use it in my studio. There's no way you would even notice the scratch and it would be invaluable for my clients. 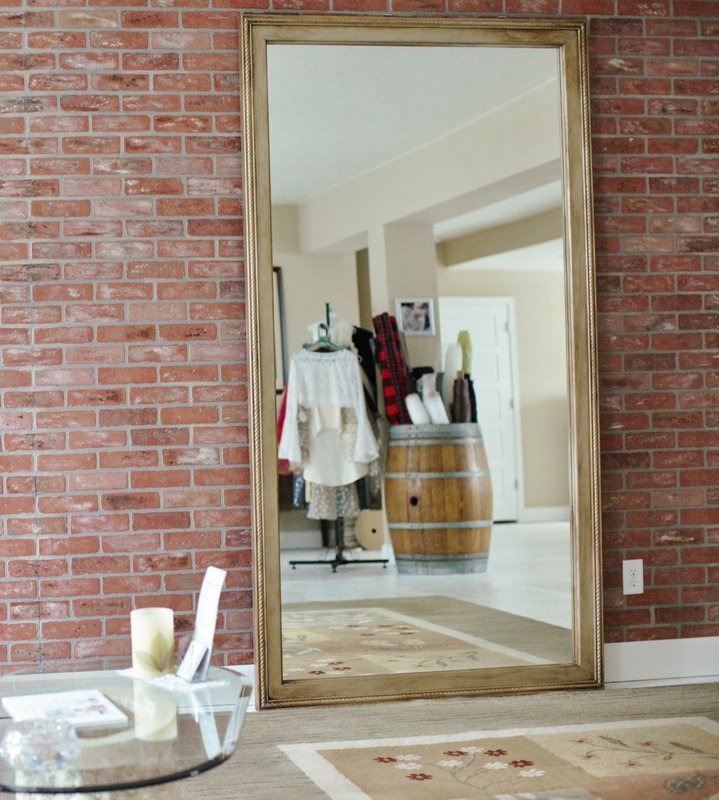 I wondered if they would allow us to keep it, or if I could buy it from them....Heck, with a DIY frame I might have the mirror I've always wanted at a price that I was willing to pay! Ssssooo, when the guys came to replace it, we posed the question if we could keep it, and the answer was yes! Woo Hoo!!!! My husband did the majority of the work on this one (thanks babe). I gave him the design, picked out the paint and then "antiqued" it a bit once the frame was finished. But the woodworking, was all him. The project began with some 2' x 6' lumber and three pieces of moulding for the accent piece. 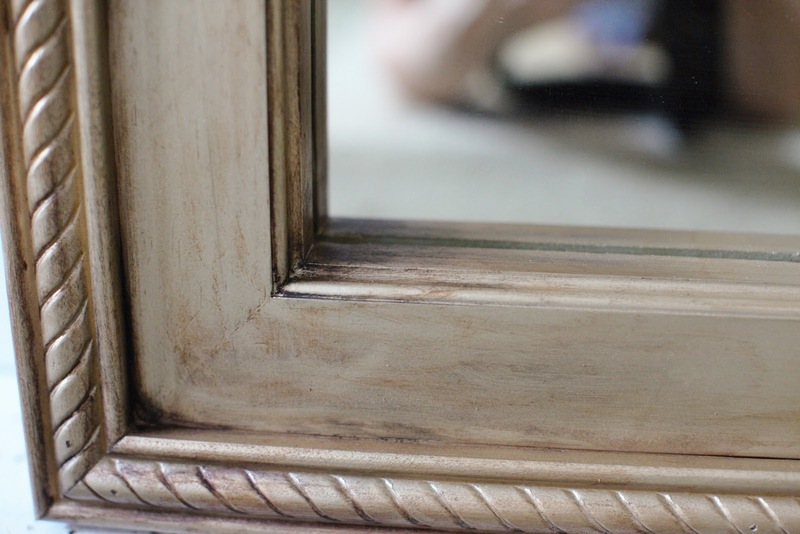 My husband used his router on the inside edge to create a nice finished edge next to the mirror; the moulding was glued and nailed to the outside edge of the boards. After it was all together it was spray painted with Rust-Oleum champagne mist; a subtle gold color. 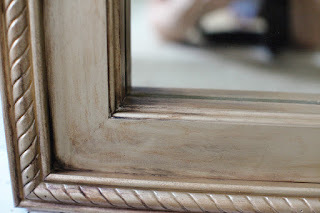 To create the antique appearance, I used a variety of craft paints, and stencil paints I already had and went over it using the stencil brush and towels to blend the brown/black into the wood. I am so happy with it! Total cost was approximately $130! That's lumber, paint and hardware. That's a steal for a mirror of this size. That's the last major project that needed to be completed to call my studio finished! Oh, I have some other accent projects in mind, but truly I now have everything I've always wanted/needed. What a lucky lady I am!